BTC/USD has a clear path till $4,500 if bulls can get over the resistance at $4,075. Bitcoin hash rate surge past 52 quintillion hashes per second which is a 4 month high. 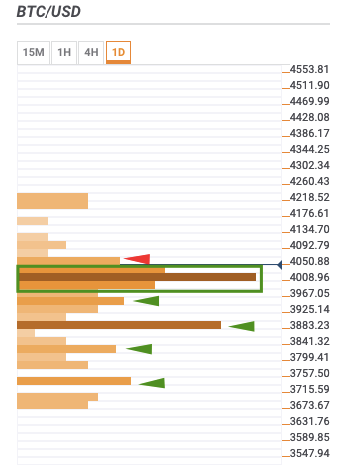 BTC/USD has a clear path to $4,500 as per the daily confluence detector. The bulls only need to get over the resistance level at $4,075. There is a lot more optimism in the market as Bitcoin’s hash rate surged past 52 quintillion hashes per second which is a four-month high. Since mining difficulty has changed little for the last month or so, new miners have had a far easier time. The only significant level of resistance lies at $4,075 which has a confluence of – 10-day simple moving average (SMA 10), 15-min previous high daily Bollinger band upper curve, hourly Bollinger band upper curve, hourly previous high, 15-min Bollinger band upper curve, 4-hour previous high, and daily previous high. $3,975-$4,025: 15-min Bollinger band lower curve, hourly previous low, SMA 50, daily 38.2% Fibonacci retracement level, SMA 10, 4-hour Bollinger band upper curve, daily 23.6% Fibonacci retracement level, SMA 5, 15-min Bollinger band middle curve, 15-min previous low, SMA 50, SMA 200, daily 61.8% Fibonacci retracement level, weekly 161.8% Fibonacci retracement level, weekly pivot point resistance 2, hourly Bollinger band middle curve, 4-hour previous low, hourly Bollinger band lower curve, daily pivot point support 1, and monthly 23.6% Fibonacci retracement level. $3,960: SMA 10, daily pivot point support 2, SMA 200, SMA 50, and 4-hour Bollinger. $3,890: Monthly 38.2% Fibonacci retracement level, weekly 61.8% Fibonacci retracement level, and daily Bollinger band middle curve. $3,825: Weekly 23.6% Fibonacci retracement level and weekly pivot point support 1. $3,745: Daily Bollinger band lower curve, SMA 50, and weekly pivot point support 2.